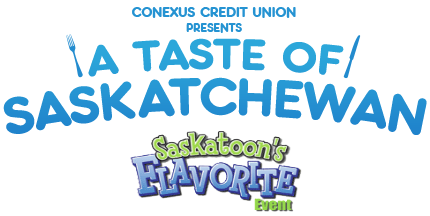 A Taste of Saskatchewan is hosted by Conexus Credit Union downtown near the Delta Bessborough hotel. This event will be held from July 10-15. Restaurants across the city work in little tents to present a few of their more popular menu items. This year there are more than 30 restaurants participating. The idea is quite simple, you purchase tickets ($2.50 for a food coupon and $5.50 for a liquor coupon) and exchange them for food. The items are more of an appetizer size to give you just a taste of the restaurant's style and to give you the chance to try many items. Last year I had to miss this for a family trip but this year I plan on going once or twice to see what it's all about. You can expect a blog post to be made as well!